It's freezing outside and we all need a warm and tasty treat to pick up our spirits. 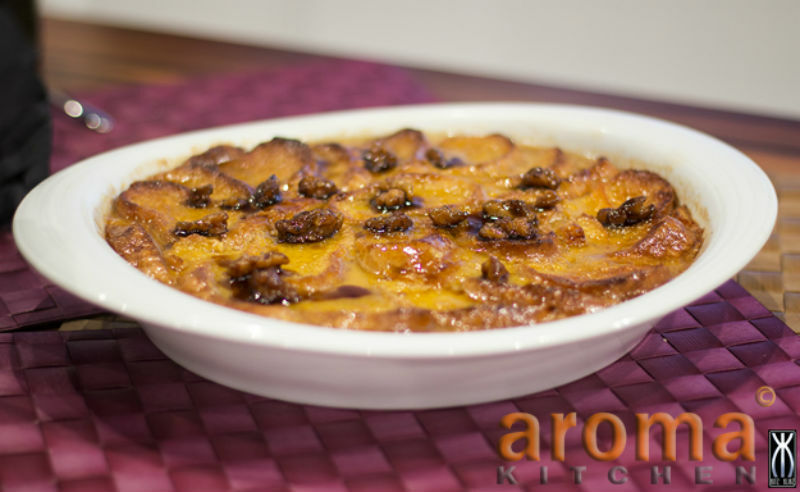 Try out this pumpkin bread and butter pudding recipe! 1. Soak the cranberries in the rum over night at room temperature, so that they absorb all the liquid. 2. Whisk the egg yolks and sugar in a mixing bowl, add the pumpkin and spices until well combined and creamy. 3. Bring the milk and cream just below boiling point and pour onto the egg mixture, whisking continuously. 4. Place any trimmings of the bread in the bottom of a casserole dish, top up the raisins and remaining liquid. 5. Dip the bread slices in the melted butter and arrange on top of the raisins over the still warm cream mixture. 6. Press down the bread so it absorbs and is completely coated with the liquid. 7. Bake in a moderate oven for approximately 30 minutes in a bain-marie until set. 8. Serve warm with the walnut syrup, whipped cream or ice cream.